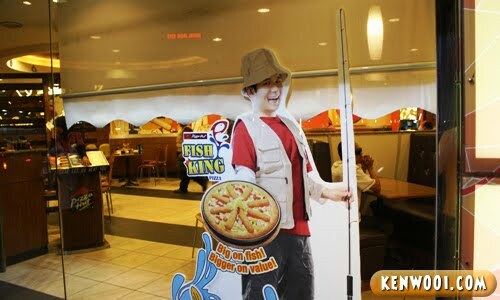 The new Fish King Pizza has been such a fishy topic nowadays. And to explore how fishy it is, I’ve decided to dive into the deep blue sea. Okay not the sea, Pizza Hut actually. Once at the outlet, I was greeted by this “fisherman” right outside. Without wasting anymore time, I headed in and ordered a Fish King family set! And after a while, the Fish King Pizza was finally served! 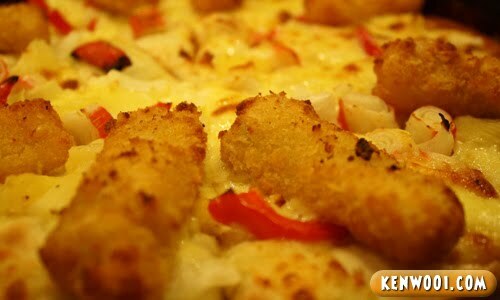 Now, let’s be mesmerized by the Alaskan Pollock (which is specially-imported) Fish Fingers on the pizza! Just look the beautiful fishy Alaskan fish fingers. You wanna just give it a bite, don’t you? One more picture before I start getting dirty with the food! 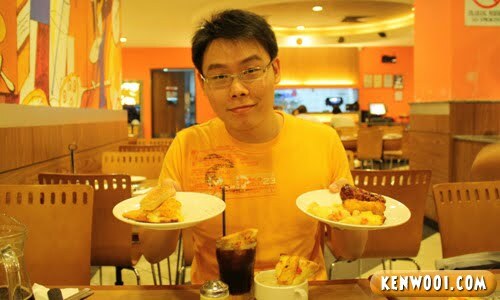 So, in-conjunction with Pizza Hut’s Fish King Pizza, I’ve improvised and created my own set meal and it’s called – Kenwooi Fish King Set Meal! And now, Ken Wooi will officiate the release of this new set by posing with the dishes! Care to try any of the dishes? Head on to Pizza Hut now! 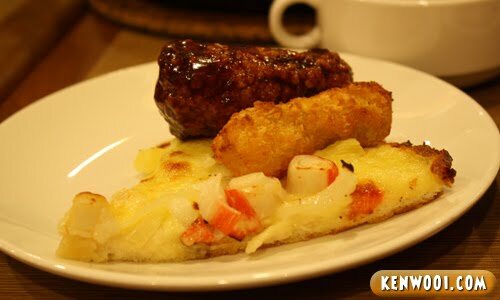 Or for delivery, call 1-300-88-2525 and request for “Kenwooi Fish King Set Meal”. As easy as that, wait no longer! 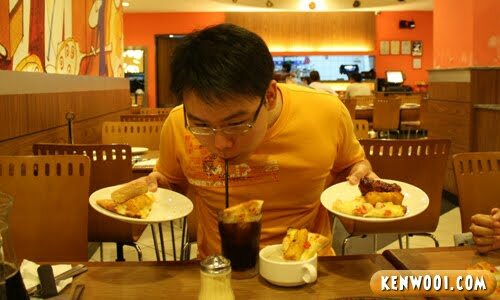 Tasting my Fish Pepsi Combo Pizza since I was pretty thirsty. Know what, it tastes wonderfully fishy! 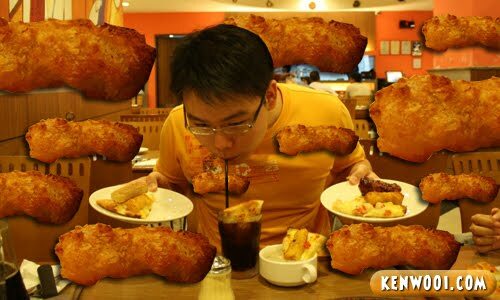 It really feels like you’re in a frenzy with lots of Alaskan Pollock Fish fingers surrounding you! 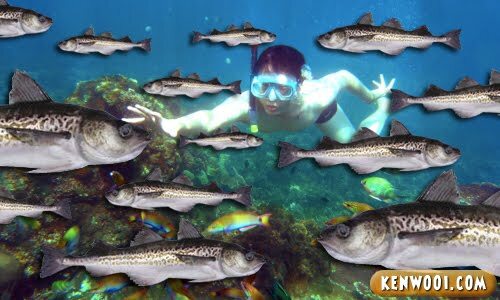 Being in the deep blue sea with plenty of living Alaskan Pollock fishes swimming with you! Oh yeah, since this is all about fish, the non-sponsors requested me to do a fish-face too. Err… okay? 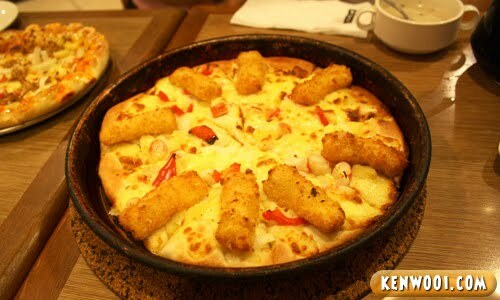 Anyway, it was a fun and delicious moment while eating the Fish King Pizza. 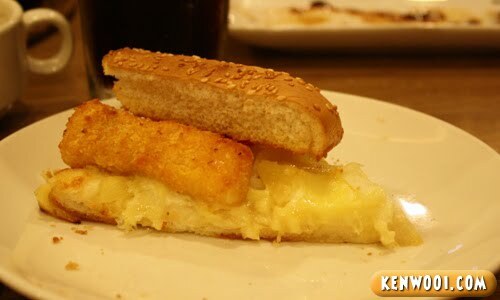 The Alaskan Pollock Fish Fingers are seriously tender on the inside and crispy on the outside. Yum yum! 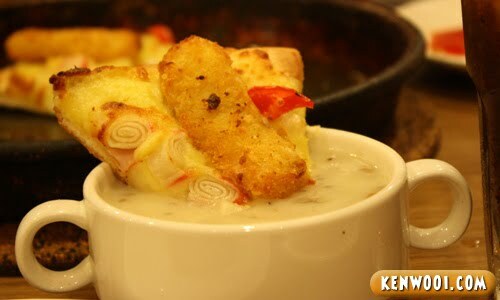 Oh yeah, anyone would like to taste another upcoming creation by Ken Wooi? 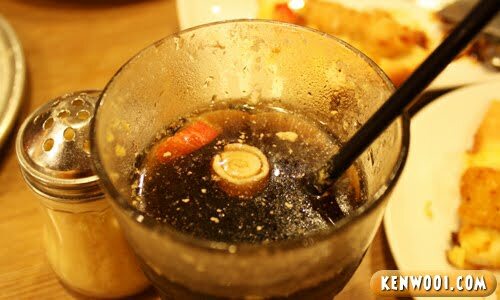 Presenting the Crab Meat Pepsi Combo Drink! 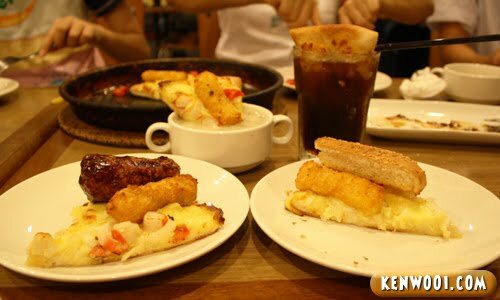 P/S: This is a contest entry written for RM10,000 Cash Up for Grabs from Pizza Hut!! by Nuffnang. Mesmerized by the drink. I wonder how many visits to the toilet after your set of so-called combo? HAHA! hahahaha.. good one…. poor people, have to wait for you to finish taking pics before they can makan. lol… real funny ! Just compare the size of the fish fingers in the brochure and the ones on your pizza. Haha! look, that fish face does look fishy…although i woundnt want to try that new drink of urs…reminds me of the good old time back in chemistry lab when my friends and I used to mix all the leftover chemicals at the end of every experiments..
Hope you win that RM2000 considering the sacrifice to your bowels..
u siaw ar? eat till like that? haha… nice one though! I haven’t gone to try yet. Looks really good. Can’t remember who posted on this…and his/hers look nicer. Hehehehehe!!!! LOL. 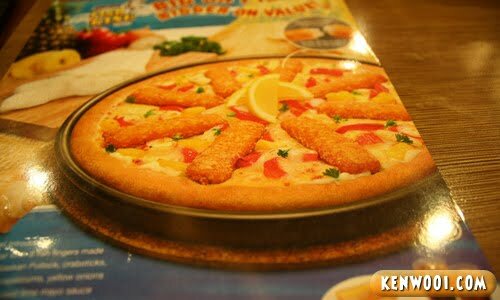 Fish Pepsi Combo Pizza? Wonders of how it taste. haha. Ok congratulations Kenwooi. 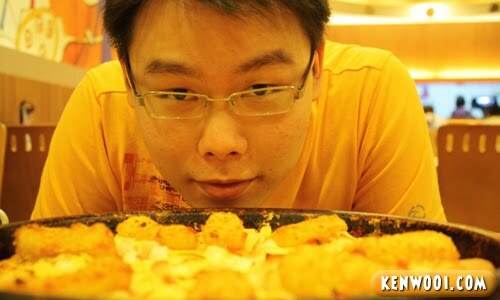 U’ve made me feel wanna jump from my bed and get that fishy pizza. Betul2 ho liao! Hohoho! mula mula i rasa tak lawak..
pas baca habis.. i senyum sorang2 he3..
good luck in da contest..
i want to join.. but no money lar rite now to go to the pizza. 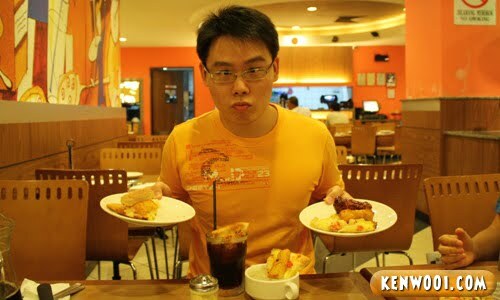 Eh Kenwooi’s eating style crazy eh!! owh!!!!!!!!!!!!!!! it’s ridiculous to let in dip in the carbonated drink!!! OH NO!!!! Crabby indeed combo “Drink pizza, eat pepsi” real hut to hut fishy. Good luck btw your home delivery can loke credit kard one ah? ~;) tQ. is the fish pepsi combo pizza nice? AwwwMeeeGawd! I wanted to try the new Fish king pizza! omg at the pepsi. hahhha. omg can’t believe you did that to your drink and still have the guts to drink it! hehehhe..hope you win the contest. smart pictures huh… i can smell who is the winner rite now..all the best. ! hahaha ur fish pepsi combo pizza buat orang terbeliak je..
hihihi, long time no visit. how r u o? 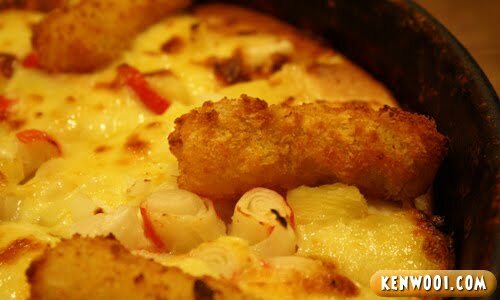 Best ke pizza… I tak kenyang kalau makan pizza.. anyway, how was shrek? is the pepsi drinkable? i wouldnt drink that. lol. Hope you can win, but I saw some posts which are more creative!! COMPETITIVE!!! 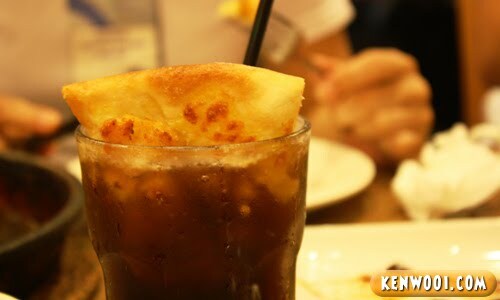 the pepsi cannot tahan ooo..
food food here n there..
OMG you really eat that pizza in pepsi? OMFG! haha..
hahaha! you’re one funny crazy guy. and that makes this entry so interesting! funny food and disgusting drinks! wah…nice post…hope u will win 10k…. as soon as i got my pay,i’m so gonna treat my family to the fish king pizza. great new recipes n pics except 4the last one.. So did you win ar? hahaha, gud look and gud luck ken. awesome!